This recipe is sponsored by Line 39 Wines, a continued partner of Heartbeet Kitchen. All along I thought I needed a deep fryer to make good chicken wings. 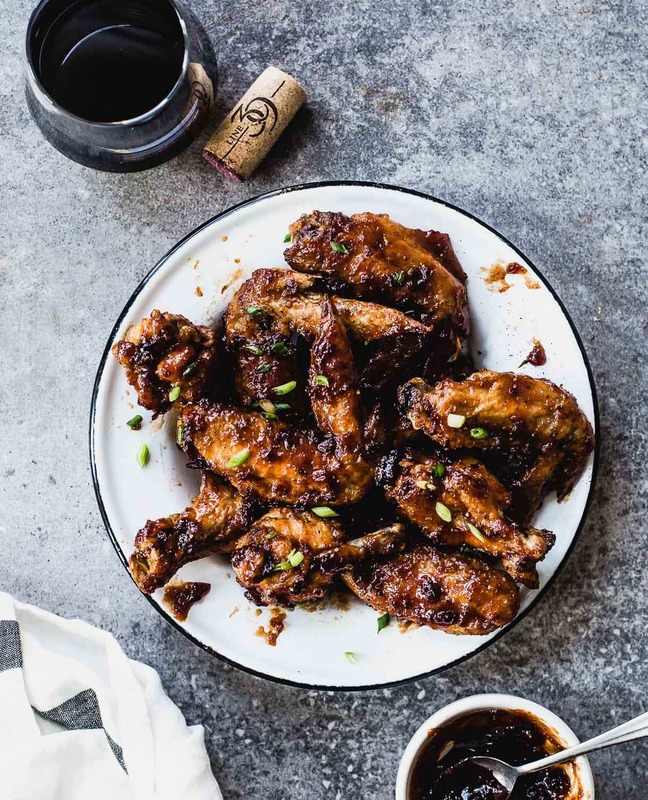 I’d been intimidated by making chicken wings at home for years. “So much easier to order at the local pub”, I told myself. However, about 2x out of 8, I wake up with a headache the next day from gluten cross contamination in the fryer. Chicken wing cravings don’t just disappear, so the ball was in my court to make them at home. I wanted them to be naturally gluten free have extra crispy, flavorful skin on the outside and juicy meat inside – without frying, or a time intensive technique. There were several methods I tried, from seasoning and refrigerating overnight, grilling, to an egg white coating that was supposed to crisp nicely in the oven, and steamed then roasted. Pat the chicken wings completely dry before you rub them with the seasoning mixture. Moisture on the exterior is what causes soggy wings. Baking powder is magical! Because it’s comprised of sodium bicarbonate, cream of tartar and cornstarch. When mixed with the spices and then rubbed onto the chicken, it dries out the skin. Leaving it crisp, brown, and crunchy. Why? Because baking powder raises the pH level in the chicken, allowing the peptide (collagen) in the skin to break down. Use a wire baking rack for the oven, so that the air can circulate around the wings, allowing them to crisp. A low to high heat bake. The low temperature lets the fat render from under the skin and seals, while the high heat cooks the meat all the way through and develop the crispy exterior. After they’ve sizzled their way into chicken wing perfection, you can slather them in any sauce you like. One of my very favorite homemade sauces is this sweet and spicy Maple Chipotle version, where spicy adobo chiles and maple syrup meet. You’ll cook the ingredients on the stovetop while the wings are baking, until thick and flavorful. 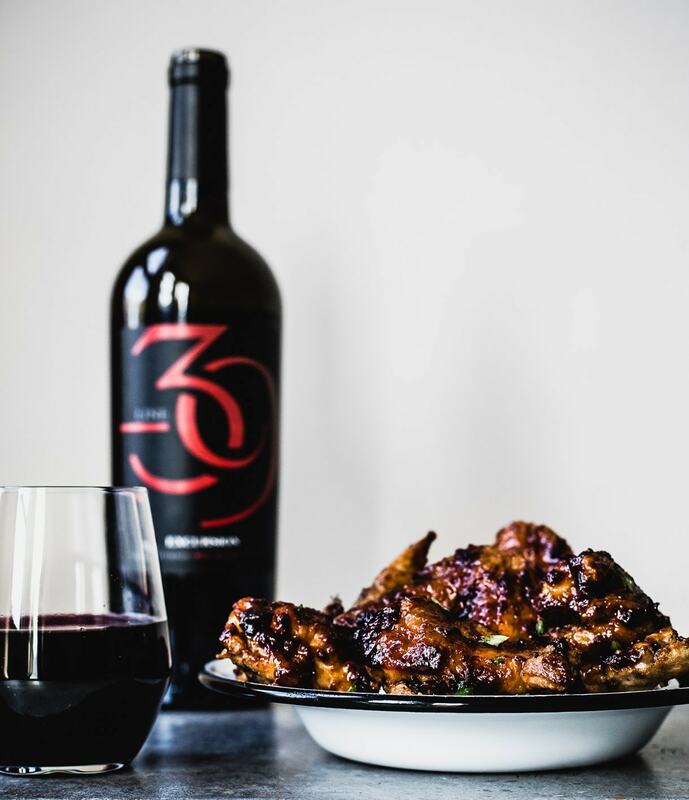 I paired this recipe with Line 39’s new Excursion Red Blend, which is jammy and rich, with notes of black fruit and vanilla. It particularly compliments the maple, and balances the heat. I love the affordability of the wine too, at about $12 per bottle, and sold at most major liquor stores around the US, like Target. You can find your nearest location here. Preheat oven to 275 degrees F. Dab chicken wings with a paper towel to get moisture off, then put in a large Ziploc bag. Add baking powder, salt, chipotle powder, and garlic powder. Shake to coat. Line a baking sheet with aluminum foil, then put a wire rack on top. 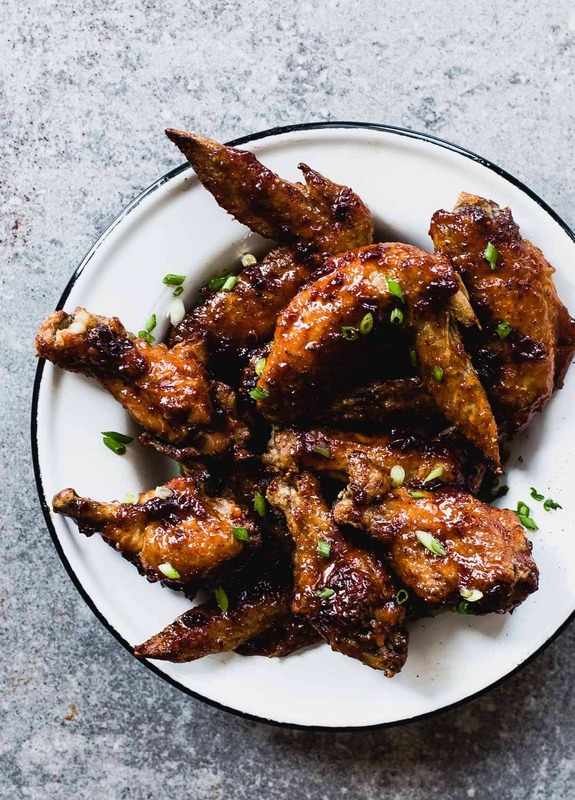 Place chicken wings on the wire rack, and bake for 20 minutes. Turn up heat to 400 degrees F, and bake for another 30 minutes, until crispy and browned. Meanwhile, add sauce ingredients to a saucepan and bring to a boil, stirring to combine and smooth. Turn down to a simmer, and cook for 10 minutes, until sauce has thickened. 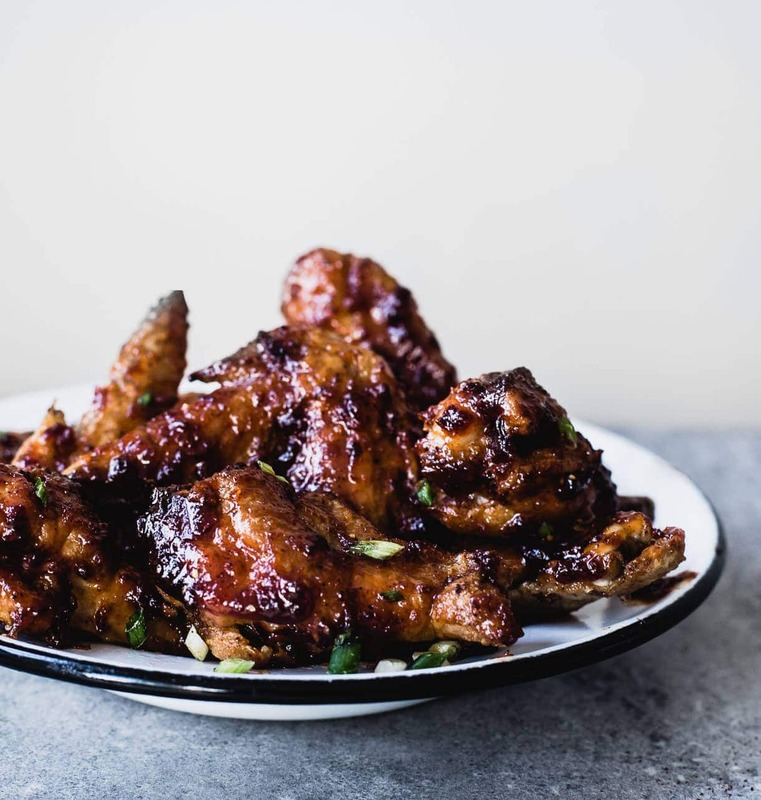 When wings are done, brush liberally with sauce and serve immediately. The tips you gave for wings can be applied to them a well? Also how sweet is the sauce? I love incorporating sweet ingredients, but tend to be leary since sometimes it will taste too sweet. It’s not very sweet. More of a smoky spice. I’ve never tried the technique with drumsticks and thighs.